I have two columns in a spreadsheet: A1:A100 has start times, and B1:B100 has duration. 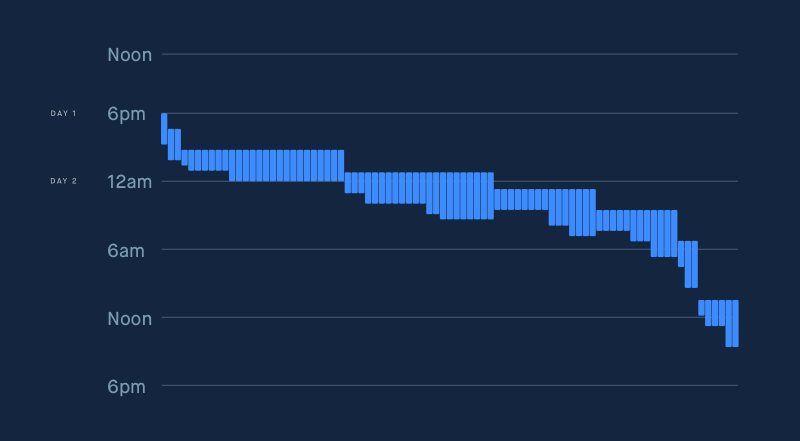 I am trying to create a chart that looks something like this, where each row gets a vertical line placed at the relevant start time (column A in the sheet) and the length of the vertical line is determined by the duration (column B in the sheet). Can it be done? I'm relatively new to this and I've tried column charts, waterfall, and scatter, but none seem to be working out very well. Not the answer you're looking for? Browse other questions tagged google-sheets formulas conditional-formatting google-sheets-charts google-sheets-charts-trendlines or ask your own question. How to change the size of a published Google Spreadsheets chart that has its own sheet?